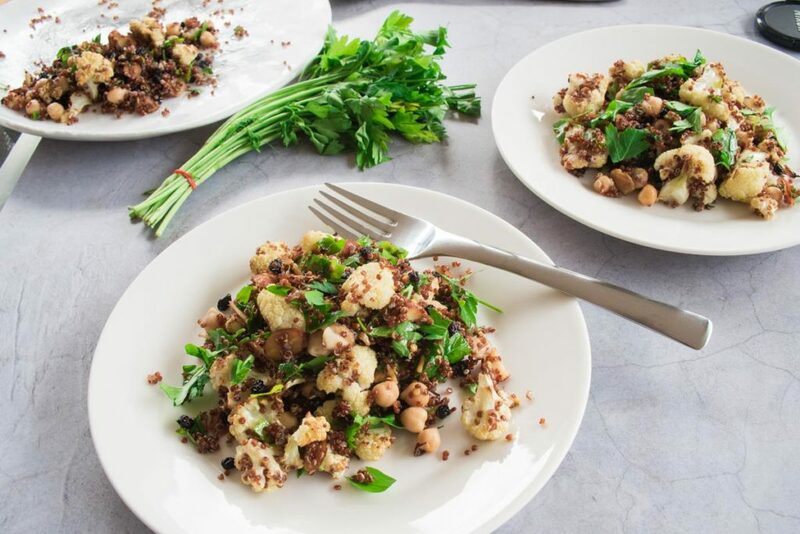 This super healthy and hearty roasted cauliflower, quinoa and almond salad is perfect on it’s own and also makes an impressive looking side for lamb or chicken. The best salads are the ones that have a combination of different tastes, textures and colours – and this cauliflower, quinoa and almond salad has exactly that. 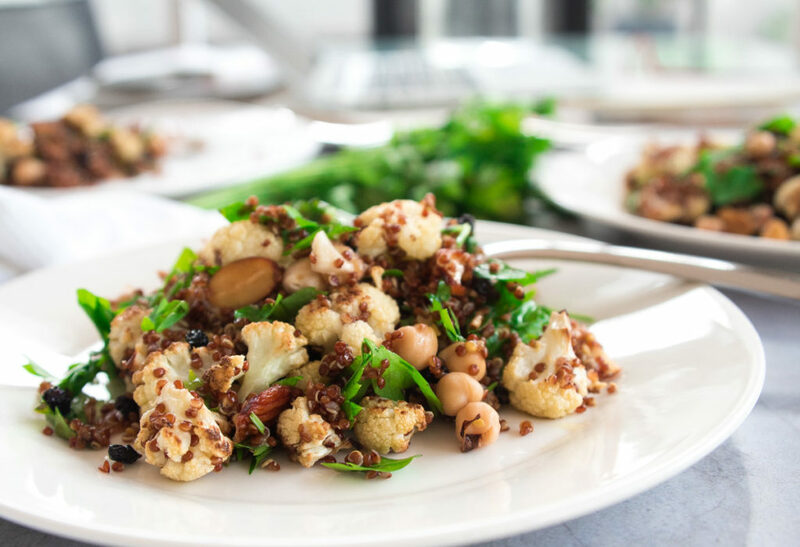 It combines one of the best salad ingredients around – roasted cauliflower – with red quinoa for a beautiful colour contrast, almonds for a bit of crunch, currants for sweetness and parsley for a bit of extra colour and herby goodness, all brought together with a delicious lemon maple dressing. 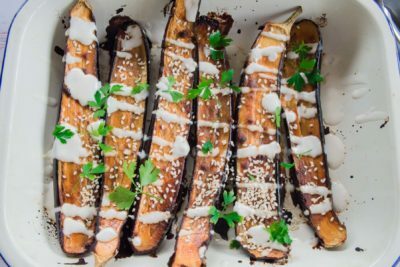 This salad also nails it from a nutrition perspective – its got protein from the quinoa, chickpeas and almonds, good carbs from the quinoa (yep, it’s high in protein AND carbs!) and healthy fats from the nuts and extra virgin olive oil. 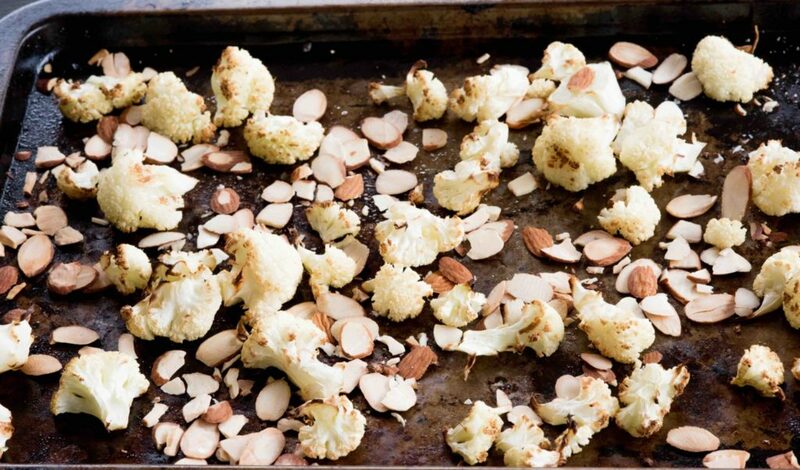 Spread cauliflower florets over a large tray and spray lightly with olive oil spray. Roast for 15-20 minutes until beginning to brown. Add almonds and roast for a further 3-5 minutes until almonds are lightly browned (keep a close eye on it as the nuts will burn very quickly). Meanwhile, place quinoa in a medium saucepan along with 2 cups water. Simmer, uncovered, for 15 minutes or until water is absorbed. To make dressing, combine all ingredients in a small bowl and mix well. Transfer quinoa to a large bowl and gently stir through roasted cauliflower and almonds, chickpeas, currants and parsley. Pour over dressing and toss through.